In a close-up view, the Space Exploration Technologies Corp., or SpaceX, Falcon 9 rocket with Dragon capsule attached on top begins a rollout demonstration test to Space Launch Complex-40 at Cape Canaveral Air Force Station in Florida. This image was taken Oct. 2, 2012. 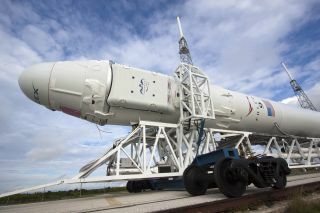 A private Dragon space capsule is poised for a weekend launch to the International Space Station with the first big cargo shipment ever aboard an unmanned American spacecraft. The gumdrop-shaped Dragon spacecraft, built by the commercial spaceflight company SpaceX, will blast off on Sunday (Oct. 7) from a launch pad at Cape Canaveral Air Force Station in Florida. Liftoff is set for 8:35 p.m. EDT (0035 Monday GMT), with a planned arrival at the station set for on Wednesday (Oct. 10). SpaceX and NASA mission managers met Friday to review the preparations for the Dragon flight atop its Falcon 9 rocket, ultimately giving the mission a final "go" for launch. There is a 60 percent chance of good weather for launch. Musk said he and his SpaceX team have done their best to ensure a successful launch Sunday, and while there is always the chance of something going wrong, "I feel like we've done everything we can to make the mission as successful as possible, and I hope people enjoy watching it." The Dragon mission, the first official cargo run by a private American-built spacecraft, is a watershed flight for NASA and SpaceX. The Hawthorne, Calif.-based company has a $1.6 billion deal with NASA for at least 12 resupply missions to the space station using its robotic Dragon capsules and their Falcon 9 rocket boosters. The deal is part of NASA's Commercial Resupply Services (CRS) program. With the retirement of NASA's space shuttle fleet last year, the space agency is depending on the availability of new private space taxis to provide unmanned cargo deliveries to the station, as well as ferry American astronauts to and from low-Earth orbit. Another U.S. company, the Virginia-based Orbital Sciences Corp., has a $1.9 billion agreement to fly at least eight resupply missions to the station using its own Antares rockets and Cygnus spacecraft, and plans to launch a rocket test flight later this year. But SpaceX is the first of the two firms to actually launch vehicles to the International Space Station. A Space Exploration Technologies, or SpaceX, Dragon spacecraft is being prepared for the company's first Commercial Resupply Services, or CRS-1, mission to the International Space Station. This image was taken Sept. 30, 2012. The May test flight did deliver some supplies to the space station, as well as return materials to Earth. But this weekend's launch will be the first of its kind, NASA officials said. "A major difference for this mission is that the Dragon will be filled with an amount of cargo suitable for an operational mission. The prior flight carried just enough items to prove the capsule would do its job as a cargo hauler," NASA officials said in a mission description. "This time, the manifest will include a freezer for the station's scientific samples, a powered middeck locker with an experiment inside along with a variety of materials for the astronauts living and working on the space station." Nearly 1,000 pounds (453 kilograms) of supplies are packed inside the Dragon spacecraft for this new mission, which is called CRS-1. After a few linked to the space station, the Dragon spacecraft will be undocked from the outpost on Oct. 28 and re-enter the Earth's atmosphere for a planned splashdown in the Pacific Ocean, off the coast of Southern California. The Dragon capsule will be filled with experiment materials and other items that need a return trip to Earth, which SpaceX officials will then deliver to NASA, mission managers said. NASA will broadcast the launch of SpaceX's Dragon flight to the space station live via its NASA TV channel, as well as on an Internet webcast. The launch coverage will begin at 6 p.m. EDT (2200 GMT) on Sunday. Today (Saturday, Oct. 6), NASA will webcast live briefings on the science experiments riding on Dragon at 3 p.m. EDT (1900 GMT), and a mission status briefing at 6 p.m. EDT (2200 GMT). "I would encourage any and everyone who get to a television or online or anything to help experience this," NASA Administrator Charles Bolden said during Friday's Google+ hangout event. "It's absolutely incredible to see something leave the planet, no matter what it is, and hopefully everybody will take advantage of the opportunity to do that."